Identification: Upperside of male is deep blue with wide black borders; hindwing orange band usually absent. Female brown with variably expressed marginal orange patch on the hindwing. 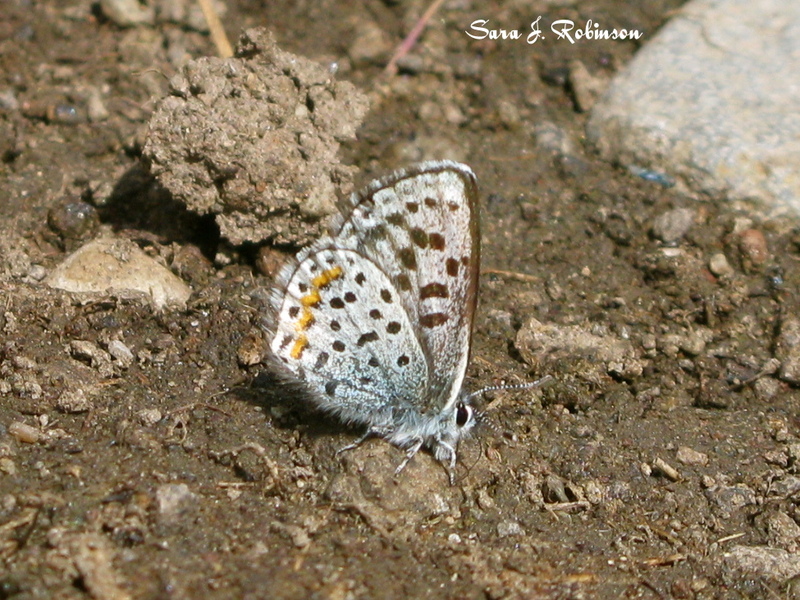 Underside of both sexes is light blue-gray with black spots. Underside of forewing often suffused with smoky gray. Wing Span: 5/8 - 1 inch (1.6 - 2.5 cm). 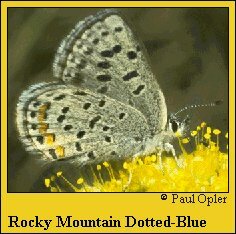 Life History: Dotted Blues usually stay near their host plants. Males patrol around the host plants all day to find females. 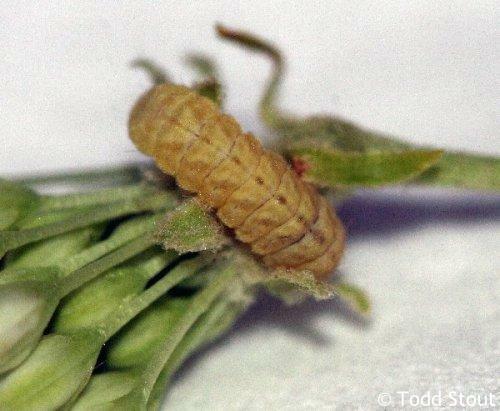 Eggs are laid singly on flowers or buds; caterpillars eat flowers and fruits and are tended by ants. Chrysalids hibernate in leaf litter. Flight: One flight; late April to early August depending on location and elevation. 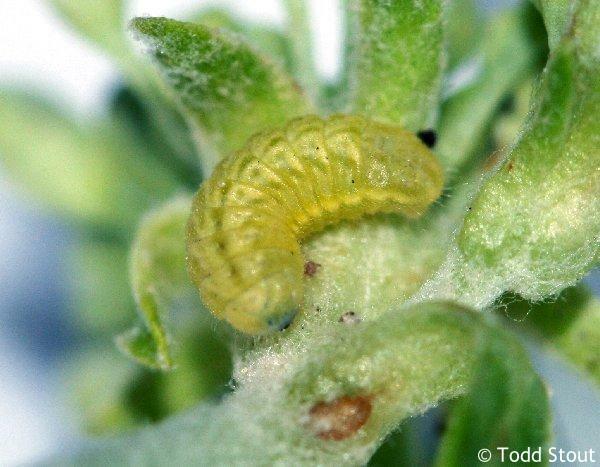 Caterpillar Hosts: Various Eriogonum species, especially Sulphur-flower. 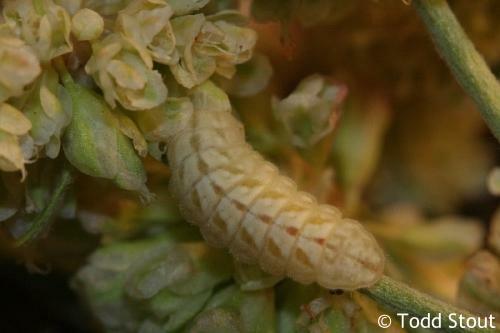 Adult Food: Flower nectar, especially from Eriogonum. Habitat: Sun-exposed rocky slopes and flats with host plant colonies. Range: Washington south to California and southern Alberta and Saskatchewan south through rockies and high plains to Wyoming, Colorado, Utah, and northwestern New Mexico. Conservation: Not required for the species, but rare subspecies in Nevada require survey and assessment of threats from alien weeds. NCGR: G5 - Demonstrably secure globally, though it may be quite rare in parts of its range, especially at the periphery. 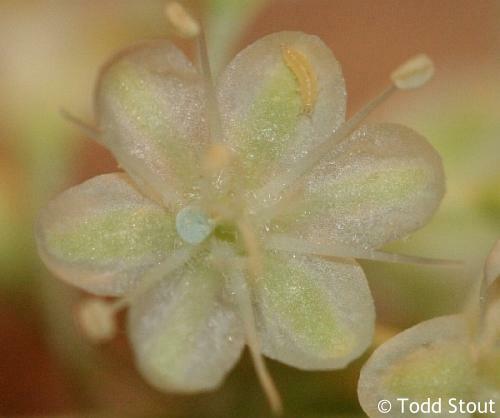 Subspecies shieldsi Austin and purpura Austin of Nevada are of high conservation concern because of their local nature and possible threat from invasive alien weeds such as cheatgrass. Management Needs: Conserve habitats for rare subspecies and maintain host plant populations.